Beginning Windows 10 takes you through the new features of this amazing new operating system, revealing some of its surprising capabilities, and helping you customize it to suit you. 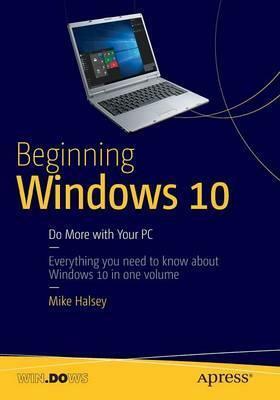 Whether you are new to Windows, or you want to get up to speed with the latest features and changes, this book has everything you need to get started. Author Mike Halsey shows you how to create an environment for school, work, and play that puts the important things at your fingertips, while combining them in ways you never thought possible. Learn how to carry your personalized Windows experience with you as part of your Microsoft account instead of having it tied to one device, while also keeping everything safe, secure and backed up, so you can enjoy peace of mind with your new PC. With the right start, your PC can become a tool that works for you, not against you, and leaves more of your time and energy free for the things that matter to you. Beginning Windows 10 shows you how. Beginning Windows 10 is for people new to Windows or who want to get up to speed with the latest version. This book also can help people who already know how to perform routine tasks learn how to get more out of Windows, their computer and their time. Whether you want to get up and running with Windows 10, or want to go to the next level and learn useful ways to minimize problems, maximize performance, and optimize your overall Windows experience, this book is for you.